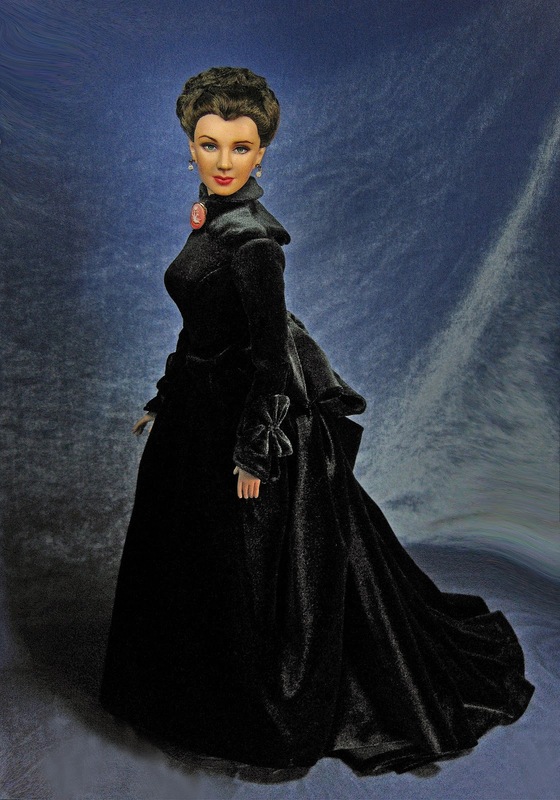 Scarlett Reverie: Tonner Scarlett wearing Franklin Mint's "Final Farewell"
Tonner Scarlett wearing Franklin Mint's "Final Farewell"
There are times when a collector just has to get another doll outfit no matter what the cost. You can call it yielding to ones' inner craziness. I am one of them. 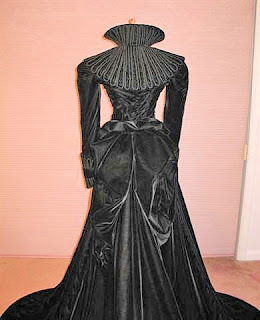 When Franklin Mint released their new Final Farewell dress, another version, another interpretation worn by Scarlett in the final sequence of Gone with the Wind, I was hesitant. Thought about it once, twice. There are times when fate leads you to have what you want. So when one member of the FranklinMintScarlettOHaraVinylDoll Group offered it to me (as she only wanted the doll), I couldn't resist. For one I knew the Franklin Mint Scarlett creations were consistently of top quality. I also knew that the dress would have a different interpretation. I was not wrong. While this would perfectly fit the FM Scarlett done for this version (which has a splendid updo), it is picture perfect on the Tonner Scarlett. 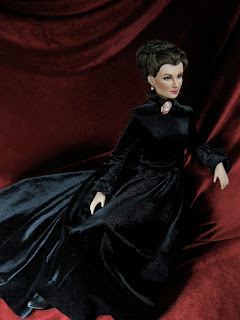 Snug and tight bodice, and just the right amount of length for the doll too -- enough to let those Tonner boots peep -- and as such, I felt, close to the length we see on film. First the jewelry is done with great attention to detail. 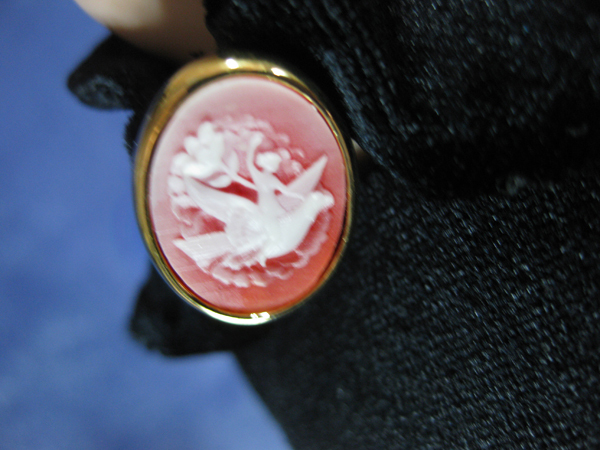 The cameo/brooch that comes with the dress is so much in scale. When one zooms in, you would think that it is an actual brooch. The mold, the relief, depth and design is amazing!! The feel is almost metallic and it seems to have some substantial weight of that too. You just have to look at this photo (below) to see and believe. That amazing jewelry! Franklin Mint is never outdone with its accessories. 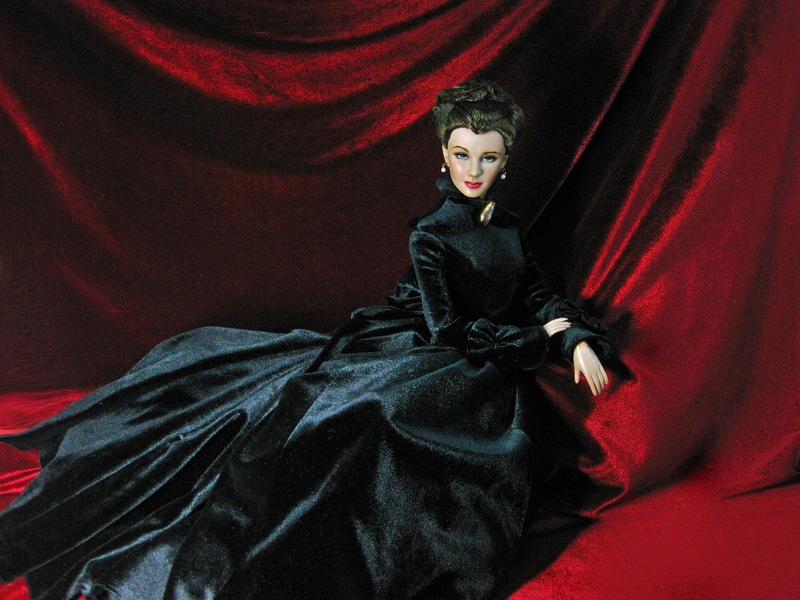 The skirt is loose unlike the Tonner's interpretation which is tight and almost with a "serpentina cut". By the time Scarlett reaches home walking in that skirt, Rhett may have already left. The train of the the Tonner "In the Mist" is of black and deep purple. It also has that "trapunto" detail on the cuffs and collar cape -- very faithful to Plunkett's design. The Tonner's version cuffs can be tightened with ribbons. 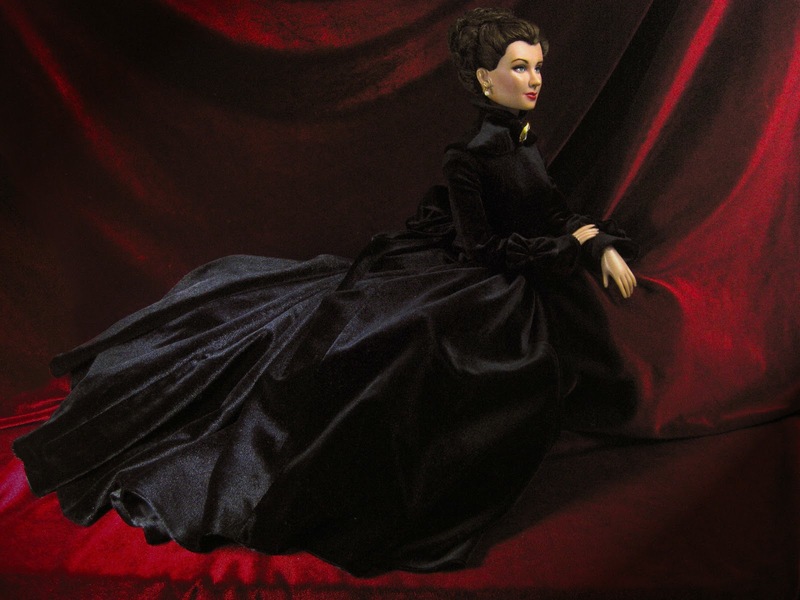 Tonner's elegant interpretation of the final dress worn by Scarlett O' Hara in Gone with the Wind. Franklin Mint's interpretation of the skirt. The bustle is accented with a large black velvet ribbon which drapes well. 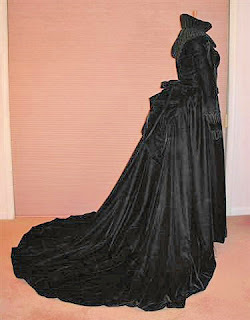 It comes with a "bustle pad" to lift the bustle. 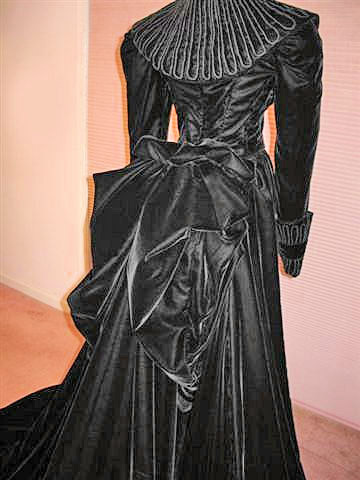 This is the recreated dress' back portion. Franklin Mint's version has none of the trapunto detail. The sleeves simulate that look with a ruffled attachment to the sleeves. 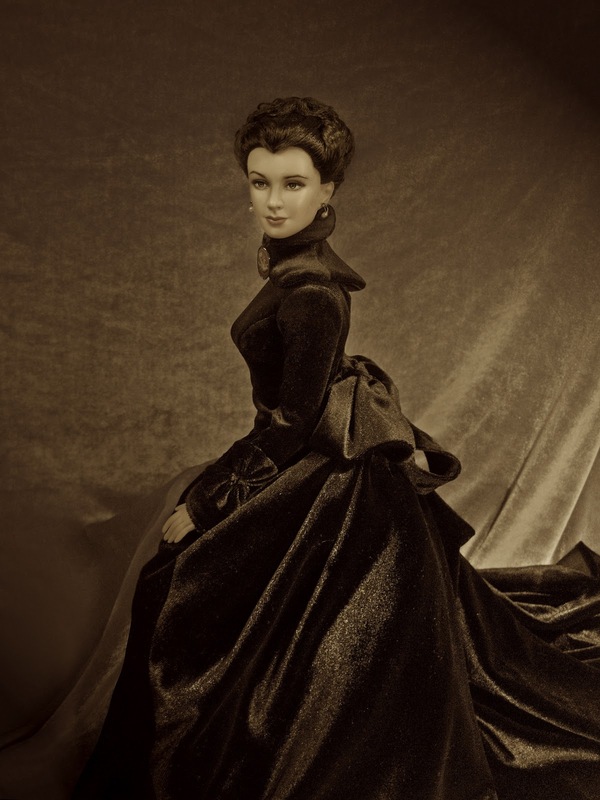 The bustle of this version however simulates the actual dress. 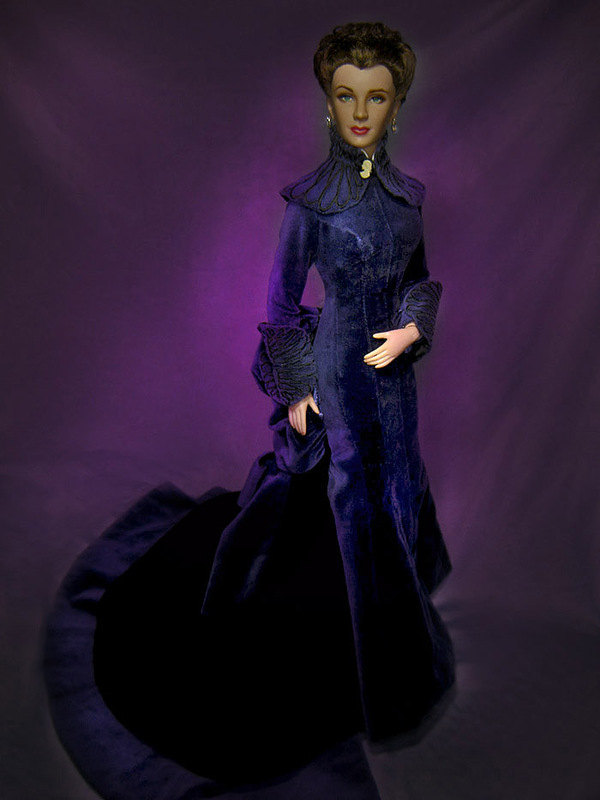 The Franklin Mint Dress as worn by a repainted Tonner Scarlett. 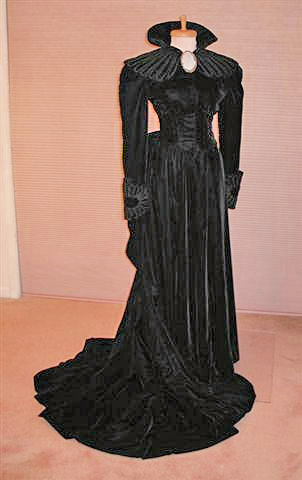 Notice how it falls and scroll up to look at the actual recreated dress. Here she is. Mrs. Butler posing with her new elegant bustle dress. And so, perhaps you'll understand how one can't just say farewell to Franklin Mint's Final Farewell. As another interpretation of the last dress worn in GWTW (at least the one we visually see), it does have its merits. 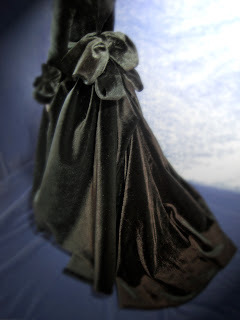 The draping of the velvet is beautiful and in scale. I have to stress this as one of the best ways to judge a doll outfit. 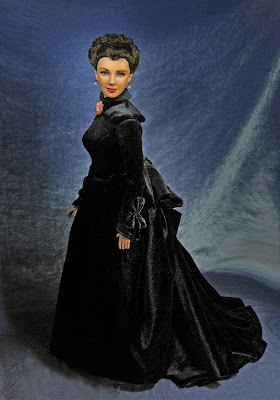 And here for her final portraits, Franklin Mint's Final Farewell as worn by a repainted Tonner Scarlett (hairstyle and face paint has been recreated to capture the "final farewell" look). Both Franklin Mint and Tonner win in this creation. Beautiful—absolutely lovely portrait - you sure made her look great! Thank you for dropping by. Scarlett appreciates the compliments and is honored it comes from a great photographer, painter and artist!